Dinosaurs in Oklahoma and our initial museum iPod audio tour experience Don’t be awed by enhanced access to administrative academic data – Look for pedagogic changes instead! Since Google announced its new web browser Chrome last fall, designed from the ground up to be faster with today’s modern web applications (webapps) I admit I’ve been a little envious of Windows users. You see, to date Chrome has only been available for Windows users. I am a cross-platform computer user, and do have access to WinXP (I remain a conscientious objector to Vista) but I prefer Macs whenever I can make a choice. I’ve used Chrome a fair bit in the past month on the Windows side, mainly working with Google Docs, and I have really liked it. The fact that Chrome runs each website tab in its own protected memory space, so one malfunctioning/misbehaving website in a single tab won’t crash the entire web browser, is the best feature of Chrome IMHO besides its snappy speed. This evening, thanks to a blog comment from CanyonR, I learned about Prism as well as Fluid. Prism is available for Windows, Mac and Linux users, Fluid is Mac-only. Neither of these programs are the Chrome web browser running on a Mac, but the functionality they offer is similar to Chrome. Both are free applications which let users run webapps as desktop apps. Each has different “engines” (code under the hood) but both allow custom icons to be used. I now have a custom desktop webapp for GMail running via Prism (Mozilla FireFox based) and a custom desktop webapp for FaceBook running via Fluid (Safari Webkit based). I configured both using custom icons developed by Chris Ivarson. These are really nothing more than just separate shortcuts to different webpages, but since these web applications truly are APPLICATIONS unto themselves, it can be nice to have them run as separate programs in system memory instead of different browser tabs or windows. It’s also nice to dispense with all the browser buttons at the top of the window, which are not really needed once you’re inside a webapp like Facebook or GMail. I am guessing these programs permit each website’s application to have separated, protected memory and therefore not crash, affect, or be affected by other webpages running in actual browser windows. Prism and Fluid definitely DO permit users to application switch using Command-Tab (Macintosh) or Alt-Tab (Windows) and treat each webapp as a separate program. This is VERY cool and useful. If so, Site Specific Browsers (SSBs) provide a great solution for your WebApp woes. Using Fluid, you can create SSBs to run each of your favorite WebApps as a separate Cocoa desktop application. Fluid gives any WebApp a home on your Mac OS X desktop complete with Dock icon, standard menu bar, logical separation from your other web browsing activity, and many, many other goodies. I used Fluid to create my Facebook SSB. I do like the fact that Fluid supports tabbed browsing, while Prism (currently) does not. I also like how Fluid-created instances actually take on the application name you assign. In contrast, Prism applications run within the application name “Prism.” Minor differences, really. The main thing is both programs offer SSB functionality, depending on the web engine you want to use. By default, SSB applications like these use the VERY small default website icons from the Internet. As an admitted Mac addict since 1995, I’ve been pretty “into” my desktop icons from time to time, and I really do like custom icons for different folders. 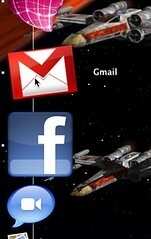 (IconFactory is my favorite source for free custom icons.) Because of my preference for large, beautiful desktop icons, the default web icons for SSBs created with Prism and Fluid are definitely NOT good enough! Riding to the rescue for my Fluid and Prism icon needs (and yours) is the Flickr Group Fluid Icons. It contains hundreds of custom icons for just about any webapp you can imagine. I’m not a licensed futurist, but the crystal ball to which I do have access at present tells me webapps, SSBs, netbooks, and offline, synchronizable web-apps powered with technologies like Google Gears are all going to be MAJOR parts of our collective communications landscape in the years to come. These technologies are a big part of our landscape NOW, but users are primarily limited to early-adopters. Whatever computer platform you’re using at present, give Prism a try. If you’re fortunate to be using a Mac, give Fluid a try too. Both are free, so the price is right. The age of web apps has dawned, and tools like these make powerful SSBs remarkably easy to create as well as customize. If you actually take this advice based on my blog post, I’m betting you fall in the left-hand third of Everett Rodger’s “diffusion of innovations” adoption curve! Thanks for sharing this. I didn’t know about these apps. I installed Fluid and love it. Will play with Prism also. These tools will make accessing information much easier. Thanks for always sharing your learning!